Many patients wish they could enjoy teeth that look more organized and uniform, but the thought of spending years wearing noticeable metal braces is just too big of a hurdle to overcome. Thankfully, Dr. Shiloh Lieberman and Dr. Erin Page offer aesthetic-minded orthodontic alternatives that can create dazzling results while allowing you to maintain a more natural appearance throughout treatment. During a personalized consultation, patients from Niskayuna and other surrounding areas can learn whether Invisalign® Clear Braces or Six Month Smiles® are right for them! Many image-conscious patients will be relieved to hear that Invisalign treatment eliminates the use of traditional silver brackets and metal wires entirely. Instead, you’re provided with a customized series of clear, plastic aligners, each one designed to represent a different stage of your orthodontic treatment. These aligners are comfortable to wear, easily removable, and designed to blend in with your natural smile, creating a subtle look that people passing by won’t even notice. The patient simply wears each aligner as directed and visits our Schenectady team every six weeks or so for brief check-ups – it’s really that easy. 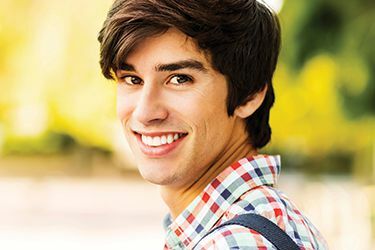 Invisalign Teen is also available for younger patients who want to maintain a stronger sense of self-confidence during their high school years. Traditional braces can require several months or even multiple years to be fully effective. Alternatively, Six Month Smiles shortens this treatment period considerably while still creating the beautiful results you’ve been hoping for! Instead of obvious metal and silver, your new braces from Dr. Lieberman and Dr. Page are composed of tooth-colored wires and clear brackets, allowing them to blend in more with your natural smile. The speediness of the treatment is also a great choice for patients who are hoping to achieve improvements before a big life event, like a wedding, high school reunion, or graduation ceremony. Just like the name implies, most cases are complete in six to nine months! For more information, contact our Schenectady dental office today to schedule a consultation with Dr. Lieberman or Dr. Page. We provide residents of Schenectady, Albany, Troy, Niskayuna, Saratoga and the entire Capital District with straight, attractive smiles using Invisalign® clear braces and Six Month Smiles®.